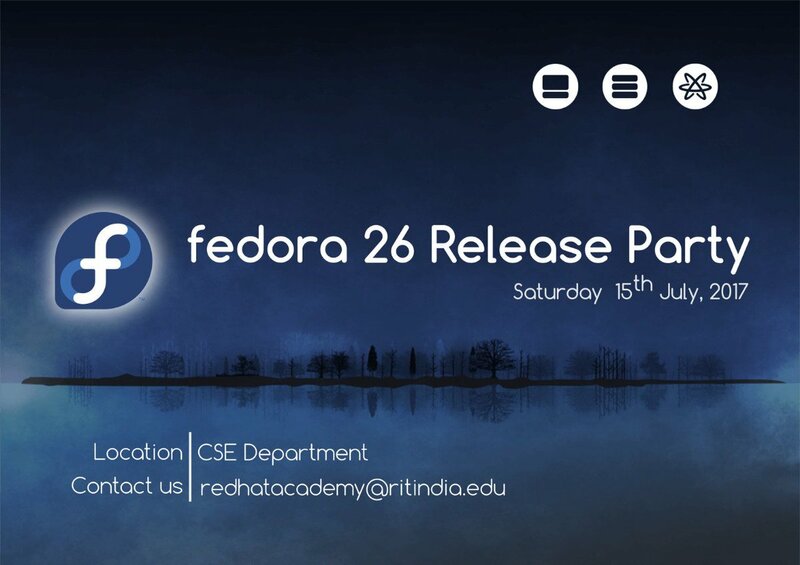 With the release of Fedora 26 on 11th of July, we thought of having release party in our college. With that thought in mind we carried out meeting and discussion on our Linux Users Group’s IRC channel on freenode (#ritinlug). Now with a proper plan we were ready to celebrate the release on 15th of July which was Saturday. We aimed at carrying out open discussions about GNU/Linux, Open Source communities, the open culture. We went to classrooms of other departments to invite students and develop interest. We also invited teachers and alumni, whose presence tremendously supported our cause. We also arranged a cake, to give the party an actual look of celebration. The prime motive was to encourage students to use GNU/Linux. The day of party came, people gathered in one of our department’s classrooms at about 10:30 in the morning. It began with Prof. S. R. Poojara’s talk. He mentioned about history of Fedora, about Red Hat Enterprise Linux’s subscription based model. He explained the concepts of up-stream and down-stream. He also talked about GNU and kernel development. I also shared my experience with GNU/Linux, how we used to boot USB drives during junior college. I started with Damn Small Linux. I mentioned about how to contribute to open source projects by first using it then reporting the issues and then submitting the changes. Next we had Vishal Ghule who is MTech graduate currently placed in CloudYuga. He explained about containers and containerization tools like Docker, Kubernetes. He gave an insight about how containers have revolutionized the industries. He motivated by asking the students to come out of the box instead of restricting themselves to only web development and app development. He introduced the concept of DevOps. After that Akshay Gaikwad shared his experience with open source tools, how he migrated to open source tools from proprietary tools. He shared different ways to contribute other than coding. Next Shahaji Shinde talked about his experience with Python programming. How Python is used in data analytics. He also introduced Tensorflow, open source libraries used for machine learning. Prof. Anil Rathod talked about being a part of a Linux Users Group and his experience with GNU/Linux. Adiya Deshpande explained why and how to switch to GNU/Linux. Dr. N. V. Dharwadkar, Head of Computer Science Department, shared his 10 years experience with Fedora. He talked about UNIX philosophy and the stability of Fedora. He also mentioned about networking tools he is using on Fedora. And lastly, Red Hat intern and RIT graduate Jatan Malde talked about Operating System and how things work. He motivated the students by asking them to keep learning and exploring. Now it was time to wrap up by feasting on cake and bring an end to the party. We all updated our systems to Fedora 26. Special thanks to Varsha Kate, Red Hat Pune for the stickers.